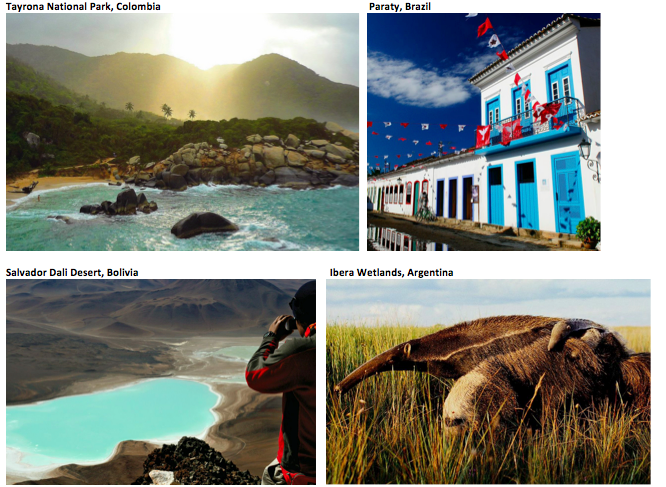 Australia's longest operating Latin America specialist, Contours Travel, has released their top South American picks for 2015. Based on travellers' interest in exploring raw and lesser-known destinations around the continent, these 10 places is a mix of untouched nature reserves, historical sites and quirky picturesque towns. 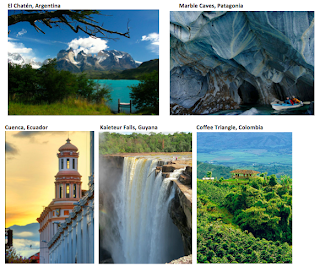 While these places may be well known among locals and special interest groups, MD Ted Dziadkiewicz noticed that they have not really been on the radar of Australian travellers; and according to him and his team of experts, "Aussies are missing out on the good stuff, the real beauty of South America!" "Most travellers who go to South America, especially those who visit for the first time, would join group tours where they are only shown the usual hot spots," says Ted. "However, not far from each hot-spot is a collection of relatively lesser-known, and often, more beautiful places that are just waiting to be explored and experienced." Translated to 'Smoking Mountain', El Chaltén is a quirky riverside mountain village set on the base of the majestic granite Fitz Roy and Cerro Torre mountains within the Glaciares National Park. Popular among climbers, this village is also known as Argentina's trekking capital. However, non-climbers are equally welcomed to enjoy the many secluded walks to take in marvel at the breathtaking surrounds. Occasionally, the mountains briefly light up in a fiery bright red during sunrise, a phenomenon known as the 'sunrise of fire'. El Chaltén is also one of the very few places where travellers can see the huemel (South Andean deer). The only way to reach El Chaltén is via a bus or car from El Calafate. While Patagonia is one of the most popular destinations in South America, the Marble Caves is a lesser-known spot for Aussie travellers, mainly because it is not easily accessible. This 6,000 year old chamber is a stunning geological formation featuring tunnels and pillars formed by crashing waves. One of its extraordinary feature is its unique capacity to change colours and appearance throughout the year. The only way to explore this marble wonder is with a paddle and a kayak, weather and water conditions permitting. The third largest city in Ecuador, Cuenca provides the intimacy of a small town. Founded in 1557, the city features a sea red tiled roofs, traditional plazas, more than 50 churches and colonial architecture. Apart from being pretty to look at, Cuenca also known for its pretty products including jewellery, textiles antiques, ceramics as well as the famous Panama hat, which is made from locally grown straw. With its city centre listed as a UNESCO World Heritage Trust site, National Geographic even listed Cuenca's flower market as the No.1 outdoor flower market in the world. Set on one of the most beautiful and untouched coastlines on the Caribbean Sea, the Tayrona National Park is home not only to white sandy beaches and lush jungle foliage, but also to well preserved ruins of ancient Indian villages. Suitable for nature lovers and adventurous souls, visitors would also enjoy the stunning views of the snow capped Sierra Navada. 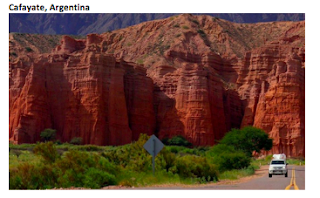 Often a place where visitors pass through to connect to other locations in Argentina, Cafayate's beauty can sometimes be overlooked. Surrounded by vineyards and rivers and home to many impressive colonial buildings, an extended stay here will expose travellers to a myriad of characters including the traditionally dressed gauchos (Argentine cowboys) riding through town on horsebacks. The town also features old-style stores offering locally made cheeses, preserves and cured meats. At 228 meters, Guyana's Kaieteur Falls is the world's highest waterfall (about four times higher than Niagara Falls). Rich in history involving the Dutch and the British, Guyana is even richer in natural assets, with rugged mountains and unspoilt forests that are bursting with wildlife including tapirs, ocelots, monkeys, armadillos, anteaters and a wide rage of birds. Also the only English-speaking country on the continent, Guyana is truly one of the last frontiers of South America. Colombia is an emerging destination for coffee lovers. With its high elevation, steady warmth and volcanic soil of the Colombian Andes, the environment is perfect for growing Arabica plants. The Coffee Triangle consists of the major cities of Manizales, Armenia and Pereira. While Armenia, capital of Quindío, has gained popularity due to its coffee-themed theme park (Parque Nacional Del Café), the triangle itself often remains in its shadow. Travellers in the region are encouraged to visit not only to learn about coffee beans, but enjoy the spectacular surrounds and jaw-dropping views of the Andean Range. Home to about 36,000 people, Paraty is a quaint colonial town filled with cobbled streets and centuries' old historical houses. Set on a beautiful stretch of coastline and surrounded by mountain ranges, this little gem offers a very different side to Brazil than the likes of São Paolo and Rio de Janeiro, where hustle and bustle is the constant theme. Paraty is a four-hour bus ride from Rio de Janeiro or three hours from São Paolo. When it comes to waterways and wildlife in South America, most people are familiar with the Amazon or the Pantanal wetland in Brazil. Very few know about the Ibera Wetlands, the second largest wetlands on the planet (after Pantanal) and the most important freshwater reservoir on the continent. Only a two-hour flight from Buenos Aires, Ibera's protected 13,000 km2 of swampland, lakes and lagoons sees that the unique wildlife in the region including the caimans, capybaras, pampas deer, howler monkeys, giant otters and anaconda, thrive. Salar de Uyuni, or better known as "Salvador Dali" Desert because of landscapes that resemble the paintings of the great surrealist painter, is the world's largest salt flat. Once almost forgotten due to its unrivalled isolation in southwest Bolivia, the moon-like surface and colourful wind-swept plains that make up the vast and vivid desert regained popularity in recent years with travellers exploring the unique landscapes that only South America can offer. To find out more about these places of interest, contact Contours Travel on 1300 135 391.